With several federal initiatives coming out soon, including the management of Controlled Unclassified Information, it’s more important than ever to understand the daily cyber risks to the federal supply chain,” said Brian Dunn, managing partner, ID Agent. 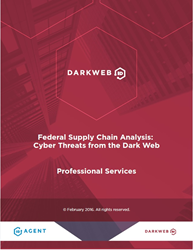 ID Agent, a division of Winvale, today launched the first in its series of Federal Supply Chain Analysis reports, highlighting cyber threats from the Dark Web. The report evaluated leading contractors from within seven professional service areas where the federal government spent more than $179 billion dollars in FY2015. The Professional Services study examined the disciplines of Advertising & Marketing, Engineering, Environmental, Financial & Accounting, Information Technology, Logistics and Management Consulting. Federal Contractors within the Financial & Accounting and Logistics fields ranked among those with the lowest cyber risk to the federal supply chain, while Advertising & Marketing and Management Consulting organizations scored the highest. “The intention of our Federal Supply Chain report is to help educate buyers and sellers to the costly blind spot of cyber risk that already exists. Cyber criminals are motivated to be successful and the public sector is under constant attack from malicious actors, terrorists, and state-sponsored espionage. Professional services firms have always made up a significant portion of the federal supply chain and together, we need to do a better job at understanding cyber risk and the decisions about sharing sensitive data. With several federal initiatives coming out soon, including the management of Controlled Unclassified Information (CUI), it’s more important than ever to understand the daily cyber risks to the federal supply chain,” said Brian Dunn, managing partner, ID Agent. The report employed the LEMMA™ Supply Chain Index, which is a proprietary algorithm used to measure an organization’s cyber risk. The algorithm includes measurements against number of employees, industry type, number of quality records found within the Dark Web and aging, among other data points. The ID Agent team conducted this study using its proprietary Dark Web ID monitoring tool, designed to help both public and private sector organizations detect and manage potential cyber threats. Dark Web ID is deployed worldwide and scours botnets, criminal chat rooms, blogs, websites and bulletin boards, peer-to-peer networks, forums, private networks and other black market sites 24/7, 365 days a year, to identify illegal buying and selling of Personally Identifiable Information (PII) online. The Dark Web ID database is among the largest in the world, having identified more than 520 million compromised records to date. Full copies of the report are available at http://www.idagent.com. Dark Web ID is a solution offered by ID Agent, a division of The Winvale Group, headquartered in Washington, D.C. ID Agent’s mission is to help clients “better protect your organization, your employees and the customers you serve.” For more than a decade, Winvale has been supporting both government agencies and the contractors that serve them with comprehensive compliance, security solutions and services. Winvale’s ID Agent & Dark Web ID solutions are used by global leaders in the finance, legal and security industries as well as the public sector to monitor organizational and individual identities.